Colonel Stratton against Skinner & al. The joint and several Answer of David Skinner and others, to the Appeal of Colonel Straton, was brought in. E. of Home against Clark. As was also, the Answer of Jacobina Clark, One of the Respondents to the amended Appeal of William Earl of Home. The Earl Fitzwalter reported, "That the Lords with White Staves had (according to Order) presented to His Majesty the Address of this House, on Thursday last, for a Copy of the Estimate of the Charge of the Troops of Hanover, in the Pay of Great Britain, for the Year 1744; and also for a State of the National Debt; and that His Majesty was pleased to say, He would give Orders accordingly." E Breadalbane against Menzies & al. & è contra. The House being moved, "That a Day may be appointed, for hearing the Cause wherein John Earl of Breadalbane and His Majesty's Advocate for Scotland are Appellants, and James Menzies of Culdairs Esquire and Angus McDonald of Kenknock Respondents, et è contra:"
It is Ordered, That this House will hear the said Cause, by Counsel, at the Bar, on Wednesday the 15th Day of February next. Clarke & al. Petition for a Bill to sell Bagnal's Estate, referred to Judges. It is Ordered, That the Consideration of the said Petition be, and is hereby, referred to the Lord Chief Baron of the Court of Exchequer and Mr. Justice Burnett; with the usual Directions, according to the Standing Order. Bowater's Petition referred to Judges. It is Ordered, That the Consideration of the said Petition be, and is hereby, referred to Mr. Justice Dennison and Mr. Baron Clarke; with the usual Directions, according to the Standing Order. Witham against Lewis; and Martin against Strachan: Writs of Error. and in the other, John Martin is Plaintiff, and John Strachan the Younger Esquire and Luke Harrison are Defendants. The House being informed, "That Mr. Baker, from the War Office, attended:"
"Estimate of the Charge of the Troops of Hanover, in the Pay of Great Britain, from the 26th of December 1743, to the 25th of December 1744." Ordered, That the said Estimate do lie on the Table. Ordered, That the same be taken into Consideration on Friday next; and the Lords to be summoned. Grant & al. against Duguid. 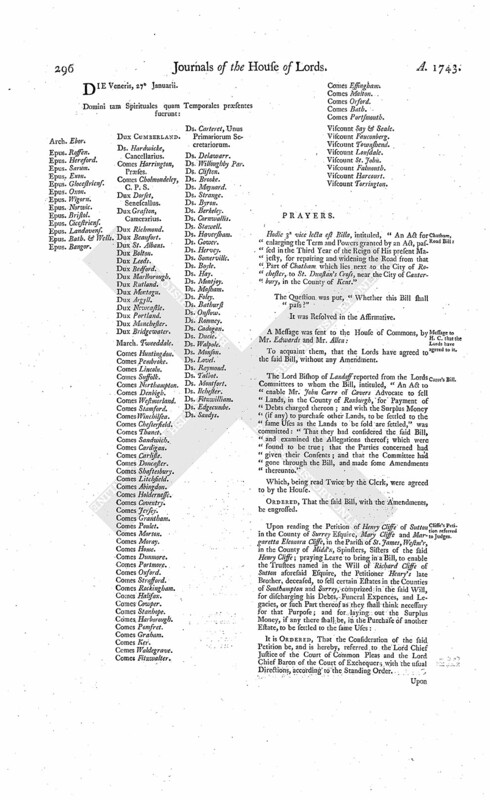 Upon reading the Petition and Appeal of Alexander Grant of Grantsfield, and John Thain Advocate in Aberdeen; complaining of an Interlocutor of the Lords of Session in Scotland, of the 9th of February 1742/3, and of their Adherence thereto, the Fourth of this Instant January, made on the Behalf of James Duguid; and praying, "That the same may be reversed, varied, or amended; and that the Appellants may have such other Relief as to the great Wisdom and Justice of this House shall seem meet:"
It is Ordered, That the said James Duguid may have a Copy of the said Appeal; and he is hereby required to put in his Answer thereunto, in Writing, on or before Tuesday the 21st Day of February next; and that Service of this Order on his Agents or Procurators in the Court below be deemed good Service. Moravia against Wintle; Writ of Error; Non pros'd. 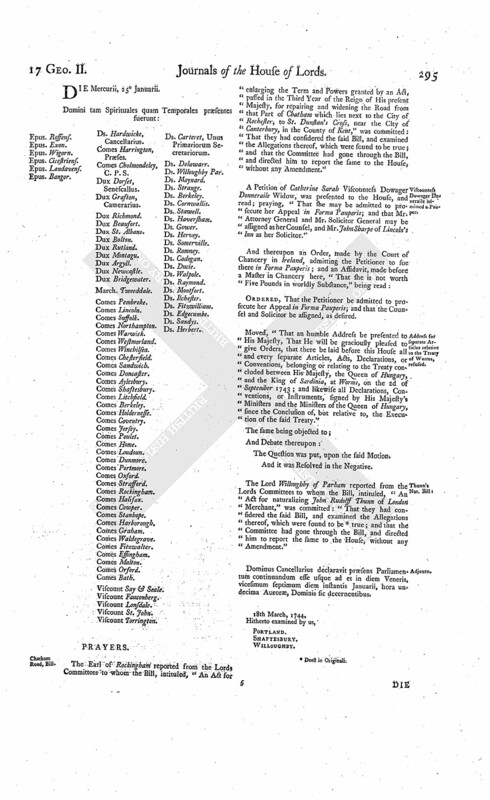 Upon reading the Petition of William Wintle, Defendant in a Writ of Error depending in this House, wherein Moses Moravia is Plaintiff; praying, "In regard the said Plaintiff has not assigned Errors within the Time limited by the Standing Order of this House, that the said Writ of Error may be Non pros'd:"
It is Ordered, That the Petitioner do forthwith enter a Non pros. on the said Writ of Error, asdesired; and that the Record be remitted to the Court of King's Bench, to the End Execution may be had upon the Judgement given in that Court, as if no such Writ of Error had been brought into this House; and further, that the Plaintiff in Error do pay, or cause to be paid, to the Defendant in Error, the Sum of Twenty Pounds, for his Costs by reason of the Delay of the Execution of the said Judgement. Dominus Cancellarius declaravit præsens Parliamentum continuandum esse usque ad et in diem Mercurii, vicesimum quartum diem instantis Januarii, hora undecima Auroræ, Dominis sic decernentibus. 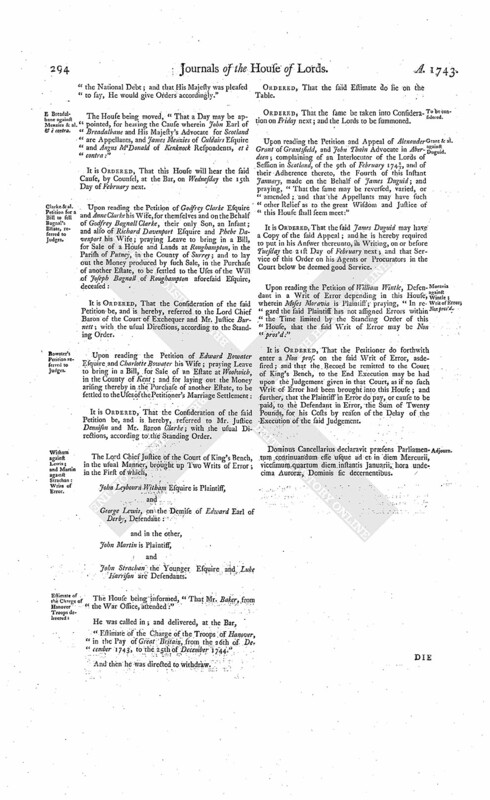 The Earl of Rockingham reported from the Lords Committees to whom the Bill, intituled, "An Act for enlarging the Term and Powers granted by an Act, passed in the Third Year of the Reign of His present Majesty, for repairing and widening the Road from that Part of Chatham which lies next to the City of Rochester, to St. Dunstan's Cross, near the City of Canterbury, in the County of Kent," was committed: That they had considered the said Bill, and examined the Allegations thereof, which were found to be true; and that the Committee had gone through the Bill, and directed him to report the same to the House, without any Amendment." Viscountess Dowager Doneraile admitted a Pauper. A Petition of Catherine Sarah Viscountess Dowager Donneraile Widow, was presented to the House, and read; praying, "That she may be admitted to prosecute her Appeal in Forma Pauperis; and that Mr. Attorney General and Mr. Solicitor General may be assigned as her Counsel, and Mr. John Sharpe of Lincoln's Inn as her Solicitor." Ordered, That the Petitioner be admitted to prosecute her Appeal in Forma Pauperis; and that the Counsel and Solicitor be assigned, as desired. Address for separate Articles relative to the Treaty of Worms, refused. Moved, "That an humble Address be presented to His Majesty, That He will be graciously pleased to give Orders, that there be laid before this House all and every separate Articles, Acts, Declarations, or Conventions, belonging or relating to the Treaty concluded between His Majesty, the Queen of Hungary, and the King of Sardinia, at Worms, on the 2d of September 1743; and likewise all Declarations, Conventions, or Instruments, signed by His Majesty's Ministers and the Ministers of the Queen of Hungary, since the Conclusion of, but relative to, the Execution of the said Treaty." The Lord Willoughby of Parham reported from the Lords Committees to whom the Bill, intituled, "An Act for naturalizing John Rudolff Thunn of London Merchant," was committed: "That they had considered the said Bill, and examined the Allegations thereof, which were found to be (fn. 1) true; and that the Committee had gone through the Bill, and directed him to report the same to the House, without any Amendment." Dominus Cancellarius declaravit præsens Parliamentum continuandum esse usque ad et in diem Veneris, vicesimum septimum diem instantis Januarii, hora undecima Auroræ, Dominis sic decernentibus. Hodie 3a vice lecta est Billa, intituled, "An Act for enlarging the Term and Powers granted by an Act, passed in the Third Year of the Reign of His present Majesty, for repairing and widening the Road from that Part of Chatham which lies next to the City of Rochester, to St. Dunstan's Cross, near the City of Canterbury, in the County of Kent." 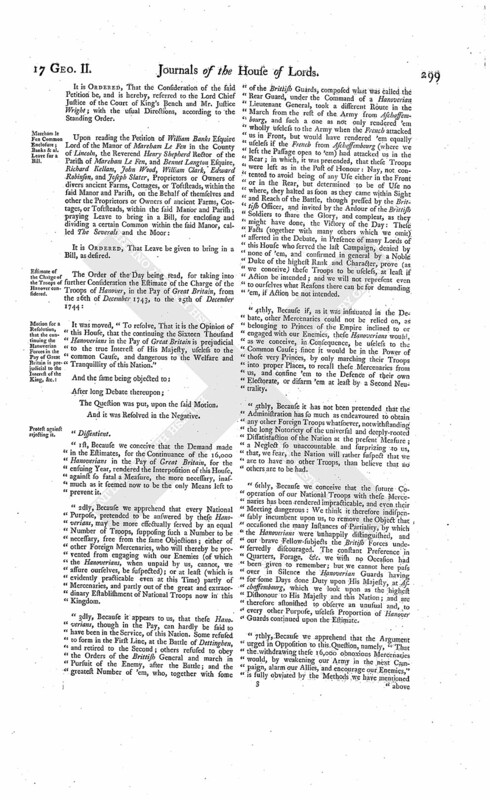 The Lord Bishop of Landaff reported from the Lords Committees to whom the Bill, intituled, "An Act to enable Mr. John Carre of Cavers Advocate to sell Lands, in the County of Roxburgh, for Payment of Debts charged thereon; and with the Surplus Money (if any) to purchase other Lands, to be settled to the same Uses as the Lands to be sold are settled," was committed: "That they had considered the said Bill, and examined the Allegations thereof; which were found to be true; that the Parties concerned had given their Consents; and that the Committee had gone through the Bill, and made some Amendments thereunto." Cliffe's Petition referred to Judges. Sir Edward Pickering and others, Leave for a Bill. Clarkes to take the Name of Stewart, Leave for a Bill. 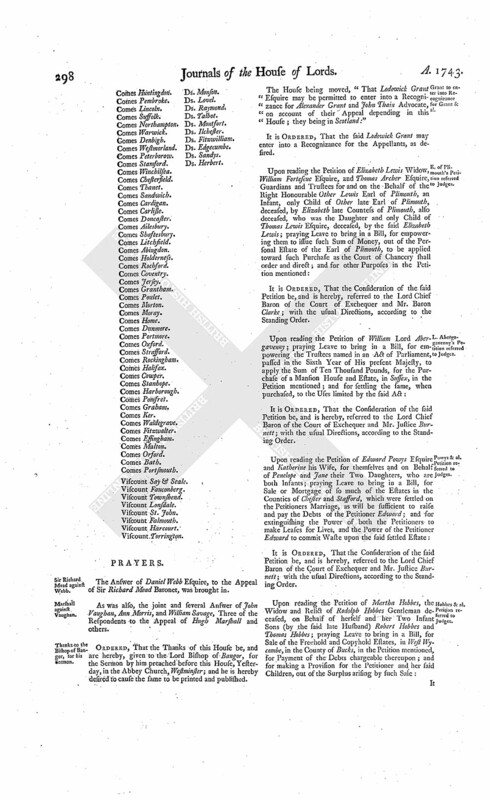 It was moved, "To resolve, That an humble Address be presented to His Majesty, earnestly beseeching His Majesty, that, in Consideration of the Jealousies and Discontent of His faithful Subjects at Home and His British Forces Abroad, He would be graciously pleased to give Orders, that the Sixteen Thousand Hanoverians be no longer continued in the Pay of Breat Britain, being prejudicial to the Public Service, inconsistent with the true Interest of His Majesty, and dangerous to the Tranquillity and Welfare of the Nation." Address that they may be no longer continued in the Pay of Great Britain, refused. The Entry in the Journal, of the 9th of December last, on the Motion then made, for an Address to His Majesty, "That the Sixteen Thousand Hanoverians, in the Pay of Great Britain, be no longer continued after the 26th of that Month," was read. 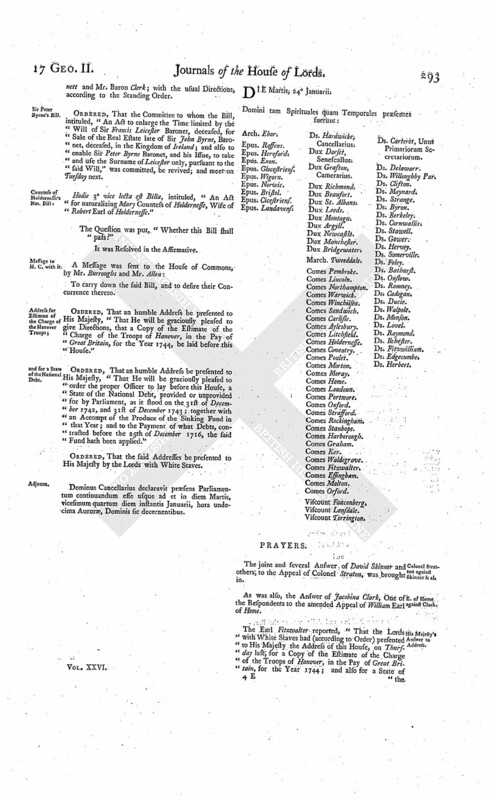 It was proposed, by Way of Amendment to the Question moved, "To add, after the Words ["be no longer continued in the Pay of Great Britain"], these Words ["after the 25th Day of March next"]." Then the previous Question was put, "Whether the said Question, so amended, shall be put?" Ordered, That this House will take into further Consideration the said Estimate, on Tuesday next; and the Lords to be summoned. Dominus Cancellarius declaravit præsens Parliamentum continuandum esse usque ad et in diem Lunæ, tricesimum diem instantis Januarii, hora decima Auroræ, Dominis sic decernentibus. Sir Richard Mead against Webb. The Answer of Daniel Webb Esquire, to the Appeal of Sir Richard Mead Baronet, was brought in. As was also, the joint and several Answer of John Vaughan, Ann Morris, and William Savage, Three of the Respondents to the Appeal of Hugh Marshall and others. Ordered, That the Thanks of this House be, and are hereby, given to the Lord Bishop of Bangor, for the Sermon by him preached before this House, Yesterday, in the Abbey Church, Westminster; and he is hereby desired to cause the same to be printed and published. Grant to enter into Recognizance for Grant & al. The House being moved, "That Lodowick Grant Esquire may be permitted to enter into a Recognizance for Alexander Grant and John Thain Advocate, on account of their Appeal depending in this House; they being in Scotland:"
It is Ordered, That the said Lodowick Grant may enter into a Recognizance for the Appellants, as desired. E. of Plimouth's Petition referred to Judges. It is Ordered, That the Consideration of the said Petition be, and is hereby, referred to the Lord Chief Baron of the Court of Exchequer and Mr. Baron Clarke; with the usual Directions, according to the Standing Order. L. Abergagavenny's Petition referred to Judges. Powys & al. Petition referred to Judges. Hobbes & al. Petition referred to Judges. It is Ordered, That the Consideration of the said Petition be, and is hereby, referred to the Lord Chief Justice of the Court of King's Bench and Mr. Justice Wright; with the usual Directions, according to the Standing Order. Mareham le Fen Common Enclosure; Banks & al. Leave for a Bill. Estimate of the Charge of the Troops of Hanover considered. 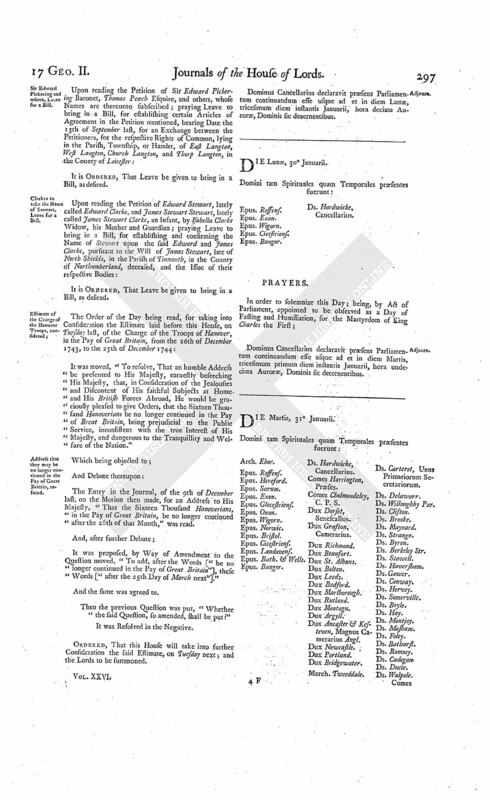 It was moved, "To resolve, That it is the Opinion of this House, that the continuing the Sixteen Thousand Hanoverians in the Pay of Great Britain is prejudicial to the true Interest of His Majesty, useless to the common Cause, and dangerous to the Welfare and Tranquillity of this Nation." "1st, Because we conceive that the Demand made in the Estimates, for the Continuance of the 16,000 Hanoverians in the Pay of Great Britain, for the ensuing Year, rendered the Interposition of this House, against so fatal a Measure, the more necessary, inasmuch as it seemed now to be the only Means left to prevent it. "2dly, Because we apprehend that every National Purpose, pretended to be answered by these Hanoverians, may be more effectually served by an equal Number of Troops, supposing such a Number to be necessary, free from the same Objections; either of other Foreign Mercenaries, who will thereby be prevented from engaging with our Enemies (of which the Hanoverians, when unpaid by us, cannot, we assure ourselves, be suspected); or at least (which is evidently practicable even at this Time) partly of Mercenaries, and partly out of the great and extraordinary Establishment of National Troops now in this Kingdom. "3dly, Because it appears to us, that these Hanoverians, though in the Pay, can hardly be said to have been in the Service, of this Nation. Some refused to form in the First Line, at the Battle of Dettinghen, and retired to the Second; others refused to obey the Orders of the Brittish General and march in Pursuit of the Enemy, after the Battle; and the greatest Number of 'em, who, together with some of the Brittish Guards, composed what was called the Rear Guard, under the Command of a Hanoverian Lieutenant General, took a different Route in the March from the rest of the Army from Aschaffembourg, and such a one as not only rendered 'em wholly useless to the Army when the French attacked us in Front, but would have rendered 'em equally useless if the French from Aschaffembourg (where we left the Passage open to 'em) had attacked us in the Rear; in which, it was pretended, that these Troops were left as in the Post of Honour: Nay, not contented to avoid being of any Use either in the Front or in the Rear, but determined to be of Use no where, they halted as soon as they came within Sight and Reach of the Battle, though pressed by the Brittish Officer, and invited by the Ardour of the Brittish Soldiers to share the Glory, and compleat, as they might have done, the Victory of the Day: These Facts (together with many others which we omit) asserted in the Debate, in Presence of many Lords of this House who served the last Campaign, denied by none of 'em, and confirmed in general by a Noble Duke of the highest Rank and Character, prove (as we conceive) these Troops to be useless, at least if Action be intended; and we will not represent even to ourselves what Reasons there can be for demanding 'em, if Action be not intended. "4thly, Because if, as it was insinuated in the Debate, other Mercenaries could not be relied on, as belonging to Princes of the Empire inclined to or engaged with our Enemies, these Hanoverians would, as we conceive, in Consequence, be useless to the Common Cause; since it would be in the Power of those very Princes, by only marching their Troops into proper Places, to recall these Mercenaries from us, and confine 'em to the Defence of their own Electorate, or disarm 'em at least by a Second Neutrality. "5thly, Because it has not been pretended that the Administration has so much as endeavoured to obtain any other Foreign Troops whatsoever, notwithstanding the long Notoriety of the universal and deeply-rooted Dissatisfaction of the Nation at the present Measure; a Neglect so unaccountable and surprizing to us, that, we fear, the Nation will rather suspect that we are to have no other Troops, than believe that no others are to be had. "6thly, Because we conceive that the future Cooperation of our National Troops with these Mercenaries has been rendered impracticable, and even their Meeting dangerous: We think it therefore indispensably incumbent upon us, to remove the Object that occasioned the many Instances of Partiality, by which the Hanoverians were unhappily distinguished, and our brave Fellow-subjects the British Forces undeservedly discouraged. The constant Preference in Quarters, Forage, &c. we wish no Occasion had been given to remember; but we cannot here pass over in Silence the Hanoverian Guards having for some Days done Duty upon His Majesty, at Aschaffembourg, which we look upon as the highest Dishonour to His Majesty and this Nation; and are therefore astonished to observe an unusual and, to every other Purpose, useless Proportion of Hanover Guards continued upon the Estimate. 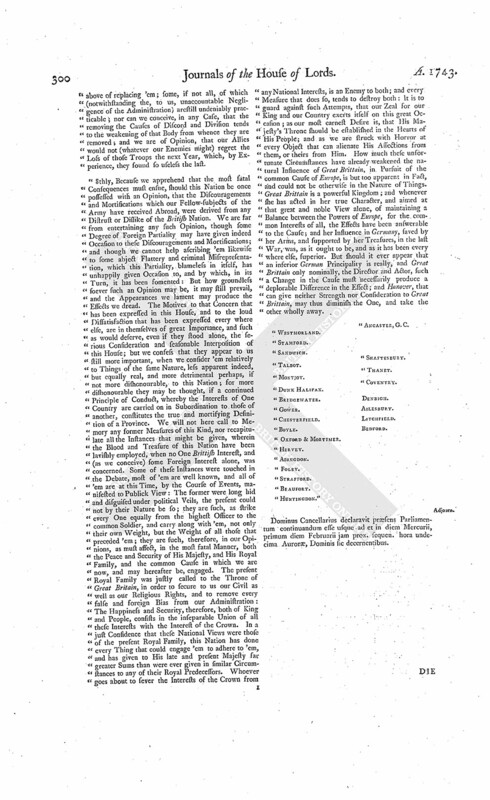 "7thly, Because we apprehend that the Argument urged in Opposition to this Question, namely, "That the withdrawing these 16,000 obnoxious Mercenaries would, by weakening our Army in the next Campaign, alarm our Allies, and encourage our Enemies," is fully obviated by the Methods we have mentioned above of replacing 'em; some, if not all, of which (notwithstanding the, to us, unaccountable Negligence of the Administration) arestill undeniably practicable; nor can we conceive, in any Case, that the removing the Causes of Discord and Division tends to the weakening of that Body from whence they are removed; and we are of Opinion, that our Allies would not (whatever our Enemies might) regret the Loss of those Troops the next Year, which, by Experience, they found so useless the last. "8thly, Because we apprehend that the most fatal Consequences must ensue, should this Nation be once possessed with an Opinion, that the Discouragements and Mortifications which our Fellow-subjects of the Army have received Abroad, were derived from any Distrust or Dislike of the British Nation. We are far from entertaining any such Opinion, though some Degree of Foreign Partiality may have given indeed Occasion to these Discouragements and Mortifications; and though we cannot help ascribing 'em likewise to some abject Flattery and criminal Misrepresentation, which this Partiality, blameless in itself, has unhappily given Occasion to, and by which, in its Turn, it has been somented: But how groundless soever such an Opinion may be, it may still prevail, and the Appearances we lament may produce the Effects we dread. The Motives to that Concern that has been expressed in this House, and to the loud Dissatisfaction that has been expressed every where else, are in themselves of great Importance, and such as would deserve, even if they stood alone, the serious Consideration and seasonable Interposition of this House; but we confess that they appear to us still more important, when we consider 'em relatively to Things of the same Nature, less apparent indeed, but equally real, and more detrimental perhaps, if not more dishonourable, to this Nation; for more dishonourable they may be thought, if a continued Principle of Conduct, whereby the Interests of One Country are carried on in Subordination to those of another, constitutes the true and mortifying Definition of a Province. We will not here call to Memory any former Measures of this Kind, nor recapitulate all the Instances that might be given, wherein the Blood and Treasure of this Nation have been lavishly employed, when no One Brittish Interest, and (as we conceive) some Foreign Interest alone, was concerned. Some of these Instances were touched in the Debate, most of 'em are well known, and all of 'em are at this Time, by the Course of Events, manifested to Publick View: The former were long hid and disguised under political Veils, the present could not by their Nature be so; they are such, as strike every One equally from the highest Officer to the common Soldier, and carry along with 'em, not only their own Weight, but the Weight of all those that preceded 'em; they are such, therefore, in our Opinions, as must affect, in the most fatal Manner, both the Peace and Security of His Majesty, and His Royal Family, and the common Cause in which we are now, and may hereafter be, engaged. The present Royal Family was justly called to the Throne of Great Britain, in order to secure to us our Civil as well as our Religious Rights, and to remove every false and foreign Bias from our Administration: The Happiness and Security, therefore, both of King and People, consists in the inseparable Union of all these Interests with the Interest of the Crown. In a just Confidence that these National Views were those of the present Royal Family, this Nation has done every Thing that could engage 'em to adhere to 'em, and has given to His late and present Majesty far greater Sums than were ever given in similar Circumstances to any of their Royal Predecessors. Whoever goes about to sever the Interests of the Crown from any National Interests, is an Enemy to both; and every Measure that does so, tends to destroy both: It is to guard against such Attempts, that our Zeal for our King and our Country exerts itself on this great Occasion; as our most earnest Desire is, that His Majesty's Throne should be established in the Hearts of His People; and as we are struck with Horror at every Object that can alienate His Affections from them, or theirs from Him. How much these unfortunate Circumstances have already weakened the natural Influence of Great Brittain, in Pursuit of the common Cause of Europe, is but too apparent in Fact, and could not be otherwise in the Nature of Things. Great Brittain is a powerful Kingdom; and whenever she has acted in her true Character, and aimed at that great and noble View alone, of maintaining a Balance between the Powers of Europe, for the common Interests of all, the Effects have been answerable to the Cause; and her Insluence in Germany, saved by her Arms, and supported by her Treasures, in the last War, was, as it ought to be, and as it has been every where else, superior. But should it ever appear that an inferior German Principality is really, and Great Brittain only nominally, the Director and Actor, such a Change in the Cause must necessarily produce a deplorable Difference in the Effect; and Hanover, that can give neither Strength nor Consideration to Great Brittain, may thus diminish the One, and take the other wholly away.